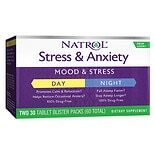 Shop Natrol Stress Anxiety Formula Dietary Supplement Capsules (90 ea. )90 ea. More than 40 million adult Americans suffer from anxiety disorders. This makes it one of the most common mental illnesses in the United States. Anxiety is actually a normal reaction to stress. For some people though, anxiety can become a burden. 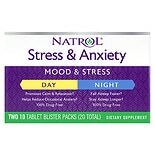 Some people prefer to use natural herbal products to help improve their anxiety symptoms. There are prescription drugs that can be used. Therapy is also an option. Discussion of your issue with your doctor is the best solution. For those that want to consider a natural supplement, there are herbal products. These herbs are valerian root and kava. It is thought they may help calm some anxious feelings. There are no studies that have shown these supplements work for this. Scientists are also looking into the benefits of taking these types of supplements by mouth. They are also looking into the chemical that is found in the brain and helps to calm nerves. 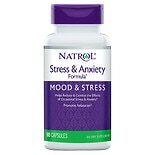 Some scientists believe taking supplements that have this chemical may help people that have anxiety symptoms. More studies need to be conducted to make sure this is true. Walgreens offers a number of herbal products. Some scientists suggest that they may help to reduce feelings of anxiety. As you compare the herbal products that may meet your needs, it's important to consider the potential side effects or risks. Supplements for anxiety should not be used by pregnant women or women who are nursing. At this time, there is not enough research to know how GABA may affect the body or what side effects it may cause. Kava has been shown to cause severe liver problems in many users. The most common side effects of valerian include headaches and not being able to sleep. All of these products should not be used if you have to have surgery. All of these products have the potential to interact with other medications or other vitamins or supplements. Before taking any supplement for anxiety, be sure to discuss it with your doctor or pharmacist. Be sure to talk about your medical history as well.